Today I attended a march on Wall Street organized by National People’s Action to protest the stranglehold big banks have over the U.S. economy. Lots of really terrible stories about people turfed out of their houses and apartments by banks after years of having lived there. 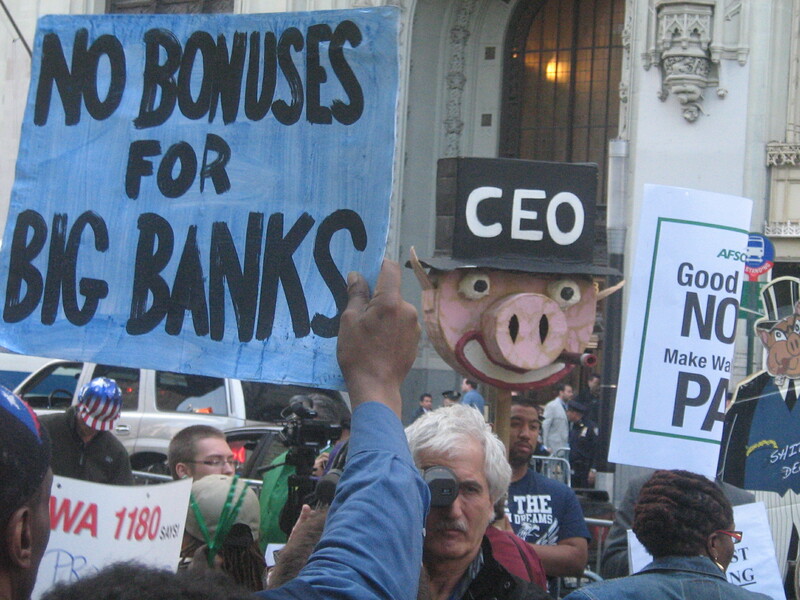 Lots of anger about the massive bonuses being awarded to bankers who just recently had to come hat in hand to the U.S. public after they screwed up their own businesses and took the world economy down in flames. The Showdown in America website contains a really impressive series of drop down discussions of problems created by corporate and banking power as well as solutions for those problems. 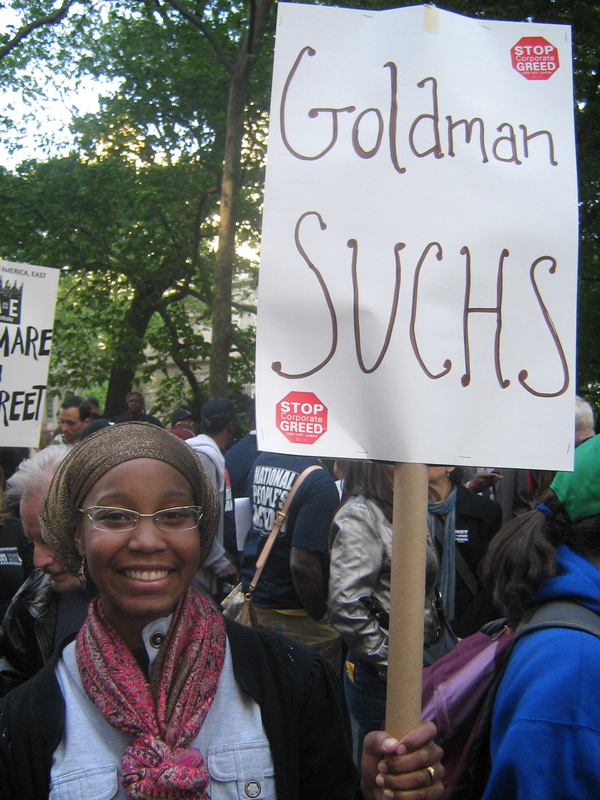 Most specifically, the organizations that are part of the campaign that organized today’s march are calling for big banks to stop targeting l0w-income and ethnic-minority communities, and to donate their obscenely large bonuses to fix state budget crises, create jobs, and keep thousand of people in their homes. 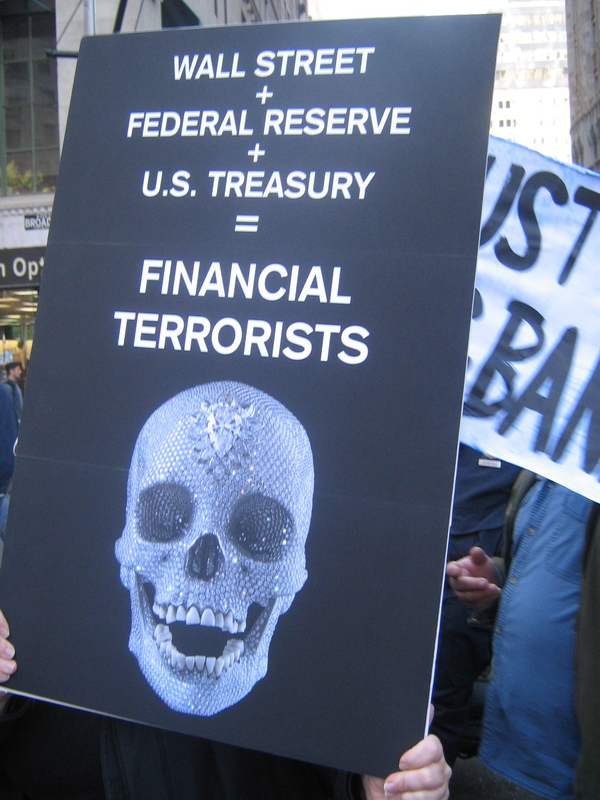 The groups also call for modernized financial regulation, including breaking up “too big to fail banks” by instituting asset caps and firewalls between banking and investment services. Perhaps most importantly for the hardest hit by the current crisis, the organizing groups call for a moratorium on foreclosures. No one should be thrown out of their homes by banks that themselves had to be bailed out by the public. It was really inspiring to be part of this protest on a beautiful clear spring day. I wish though that the protest had been more large and more militant. I’ve been on countless demos since 2001 in NYC and the drill is now almost always exactly the same. The cops set up steel barricades that pen crowds in to small cellular groups. Movement from one cell to the next is tightly controlled by the police. The streets are kept completely open for the free flow of traffic – nothing can impinge on the sacred space of the automobile! When marches eventually start, they are completely contained in exactly the same way as the pre-march demo. Unfortunately I’m very skeptical about how much this approach can accomplish. During the demo I had an interesting conversation with Jonathan Tasini, a candidate for NY State Senate with whom I was imprisoned a couple of years back when we both did civil disobedience on Fifth Avenue in support of the grad employees unionization efforts at NYU. Tasini suggested that what we really need to do to get Wall Street’s attention is to break down those damn steel barricades and sit down en masse in the middle of Broadway. If several thousand people did this, they’d gum up the police works for days. He pointed out that we were only about 30 people getting arrested at the NYU demo and it took them hours to process us. He’s got a good point. Why are there no mass non-violent direct action campaigns going on at the moment given all the calamitous events taking place? Why are there no leaders willing to advocate tactics such as those pioneered by Gandhi and Martin Luther King, Jr.? Surely the times call for such courageous leadership and behavior.